That would be Joakim Noah, who missed Monday’s loss to Minnesota because of illness, and Kirk Hinrich, who missed the last four games with a hamstring injury. Noah actually said he wasn’t feeling all that much improved, likening his state to a form or organic fertilizer. Noah was queried about what exactly was wrong, perhaps viral? As the Bulls gained 50 degrees by going to San Antonio and still weren’t getting much above 38 degrees, any sort of unusual body reaction was not inappropriate. Santa Anna may not have wanted the Alamo mission so badly had the temperatures been similar back then. Of course, he could have been distracted these days by the Alamo McDonalds around the corner. Noah estimated his playing possibility as “50-50,” showing he is better at math than Yogi Berra, who had estimated the game 90 percent mental and the other half physical. Noah looked like someone who would be playing. He’s also looking like someone who will be selected by the coaches in voting announced 6 p.m. Thursday on TNT to go to his second consecutive NBA All-Star Game. Noah didn’t want to talk much about it, saying he was just trying to get back to full health to play and help the team as it begins a tough six-game Western Conference road trip. The Bulls are 3-10 in San Antonio since Michael Jordan retired and 10-28 since Texas became a state. But others were glad to talk about Noah’s All-Star prospects. Hinrich, who doesn’t wear shock much on his face, agreed he would be if Noah were left off the team. For others as well. The Bulls have one of the better groups of people as you rarely hear of internal issues. And it’s clear in the way they compete. When teams arrive at their hotels on the road or go to their buses in public areas, there generally are fans standing waiting for autographs. Many are there to get an autograph and try to sell it. The players understand, and also there are security concerns. Plus, they are on schedules. So they don’t always stop to chat. Noah often will be one of the players to stop, especially when kids are there, to pose for a picture or sign something. His big heart extends way beyond the basketball court. Hinrich would do so as well. But no one knows who he is. Actually, he is very cooperative. Though Hinrich sounded like he wanted to give it a try Wednesday for at least a bit of time, the team does have two days off after the Spurs game before three in four nights in New Orleans, Sacramento and Phoenix. So they might elect to hold Hinrich out one more game. Thibodeau also said he expects Noah to be added to the All-Star team and that he believes this is Noah’s best season. 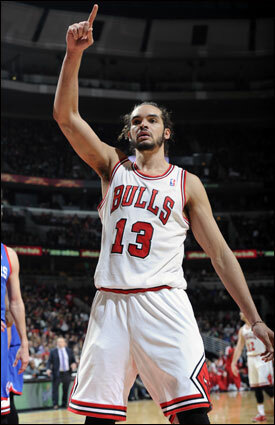 Noah is averaging 11.7 points, 11.4 rebounds and 4.1 assists with double figure rebounding his last 16 games. The Bulls also will see former teammate Marco Belinelli, who is leading the league in three point shooting among players with more than 100 attempts. Though the Spurs are counting players as well with Manu Ginobili hurt in Tuesday’s loss to Houston and joining Kawhi Leonard, Danny Green and Tiago Splitter injured. As for the Bulls, it’s also another beginning as the team heads into the second half of the season .500.